11:45 AM –Mattingly Brewing Company in St. Louis, MO. 4:00 PM – Illinois Brewing Company in Bloomington, IL. 5:15 PM – Destihl Restaurant and Brew Works in Normal, IL. 9:15 PM – Carlyle Brewing Company in Rockford, IL. 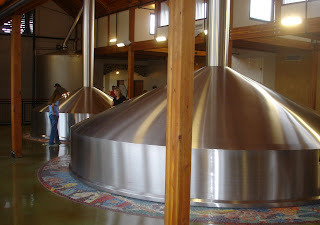 10:00 AM – New Glarus Brewing Company in New Glarus, WI. 11:45 AM – Great Dane Brewing Company in Madison, WI. 2:00 PM – Tyranena Brewing Company in Lake Mills, WI. 4:00 PM – Sprecher Brewing Company in Glendale, WI. 5:45 PM – Miller Park for Brewers game. 11:00 AM – Milwaukee Ale House in Milwaukee, WI. 1:45 PM – Hops Haven Brew Haus in Sheboygan, WI. 4:00 PM – The Courthouse Pub in Manitowoc, WI. 6:00 PM – Titletown Brewing Company in Green Bay, WI. 8:15 PM – Stone Cellar Brewpub in Appleton, WI. 9:00 AM – O’so Brewing Company in Plover, WI. 11:00 AM – Red Eye Brewing Company in Wausau, WI. 2:45 PM – Das Bierhaus in Menomonie, WI. 5:30 PM – Surly Brewing Company in Brooklyn Center, MN. 8:15 PM – Barley John’s Brewpub in New Brighton, MN. 10:30 AM – Summit Brewing Company in St. Paul, MN. 12:00 PM – Minneapolis Town Hall Brewery in Minneapolis, MN. 3:30 PM – Worth Brewing Company in Northwood, IA. 7:00 PM – Raccoon River Brewing Company in Des Moines, IA. Horny Goat Brewing Company in Milwaukee, WI on Thursday morning. Flat Earth Brewing Company in St. Paul, MN on Friday afternoon. Rush River Brewing Company in River Falls, WI on Friday afternoon. Beer Trip III was July 25-29, 2007. This trip was the second with the EM-50 and would take us east this time. The trip started out with a black cloud over it, as our founder and leader, Dan, was sick beyond belief when we rolled out of Overland Park. The trip this time had me, Dan, Andy, Jerry, and new inductees Kelly and Ed. Our first stop was across Missouri to O’Fallon Brewing Company in, you guessed, O’Fallon, MO. We arrived a little before 11AM for our tour and tasting. Our tour guide was Fran Caradonna, co-owner with her husband Tony, and she could not have treated us better. Small, but definitely growing operation. From there it was on to Schlafly’s Taproom in St. Louis. Great food and great beers as expected. Dan had a sickness spell, but being a trooper, he soldiered on. No tour there as it’s their brewpub as opposed to the brewery itself. 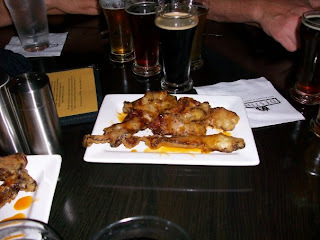 We enjoyed several great brews before heading out to Evansville, IN to Turoni’s Pizzery and Brewery for dinner. We arrived about 5PM and Dan immediately went to use the facilities. The rest of us sat around feeling horrible that he was so sick. We ate and tried a few beers and decided to get going on to our final destination of the day, Louisville, KY.
We arrived in Louisville pretty late due to the time change from Central Time to Eastern Time. We checked into our hotel which was way nicer than expected, a high rise in downtown Louisville. We decided to just hit Bluegrass Brewing Company since it was late. The cab ride there was terrifying on the way there. I’d expect that in Chicago or another huge city, but we were flying through Louisville like we were being chased by cops. We managed to safely arrive despite the ride over. We were split into two cabs, and the other half had a similar experience. Have to say BBC was an awesome place. I wasn’t expecting much, but it blew me away. The beers lived up to the reputation and were great. But the atmosphere itself made it all the better. Basically they had open jam sessions where people bring their guitars and jam out on the patio. The crowds were crazy as well, and that just added to the fun. After that we cabbed it back to downtown and crashed to rest up for the next day. The next morning we were up early and ready to start heading north into Ohio. Our first stop was Cincinnati and BarrelHouse Brewing. The brewer treated us great and took us all through the operation. We all know the process very well, but it’s always fun to see at the same time. We all bought a case of bombers, and loaded up for the traditional Brewers game over at Great American Ball Park. The game was a loss, so we’ll move on, except to say they did offer some beers besides Bud/Miller/Coors at the stadium. Next was Columbus and Barley’s Brewing. This is the point Dan seemed to be at his sickest. He looked awful and spent most of the time in the restroom. Surprisingly good brews and food, although Dan still being sick was a huge bummer. We headed on out for Cleveland, hoping for a leader that felt better and good times. Like all things though, it must get worse before it can better. We arrived in Cleveland after dark and headed to the downtown Holiday Inn. We passed an exit for Parma en route, and I being drunk had spent the whole time singing “Moon Over Parma” from the Drew Carey Show. Surprised no one punched me. There were huge crowds in the lobby, and something felt off. I go to check in as the rooms were under my name. I stood in line for probably a half hour before getting to the counter. I give her my confirmation info and found out they had overbooked the hotel and we had no rooms. They had a Postal Service convention in town, and they took all the rooms. After waiting for what seemed like an eternity, we were sent a half hour south to another Holiday Inn out in the suburbs. No apologies and acted like we should be grateful they did that for us. We decided to hit Great Lakes Brewery before going to the hotel since they were on the way. Great Lakes was in a great area of Cleveland and had a cool set up. The manager couldn’t have treated us better, as he took Dan (who finally was feeling better) and Andy to the already-closed-for-the-night gift shop and gave them a GLBC banner and some free schwag. They let us hang out for a bit even after they closed, giving us a couple of pitchers of whatever we wanted. Ed was cool enough to drive for us so I could drink away my frustration with Holiday Inn and the rest could live it up. We drove out to the ‘burbs and checked in to the hotel and passed out, not suspecting the next day would be one of the most memorable in Beer Trip history…. 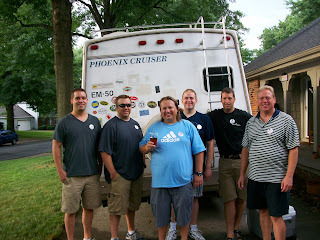 In my opinion, one of the best days of any of the Beer Trips was Day Two of Beer Trip 3.5. Day One was a good day, as Andy, Ed, Jerry, Kelly, Tim, and I went to a couple of places in Springfield, MO. We had lunch at Springfield Brewing Company, who were kind enough to let us in early and label our tab as “Drunk Early Guys” on the bill. After lunch, we headed over to the now-defunct Hickok’s Steakhouse for a sampler of their beers, which were nice enough. After that, we left Springfield and headed to Bootlegger’s in Aurora for another round of samplers. The day ended with us in Little Rock, having dinner at Bosco’s before walking over to end the night at the Flying Saucer for some quality brews. But really, Day Two is what made the trip. We started out going over to Vino’s for some of their pizza and beers. 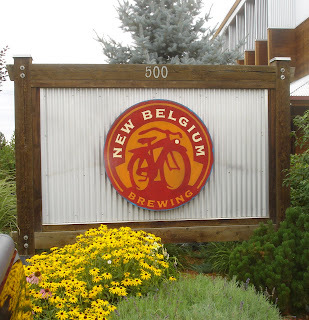 Really, really good pizza, and even better beers. The place itself is a grungy building with the pizza joint and brewpub up front, and a rock stage in back. I keep telling my brother-in-law that his band needs to play there, because I imagine they have some pretty good crowds there. After that, I had scheduled a tour with Diamond Bear, not only for Beer Trip, but because I was writing an article and would be discussing them. 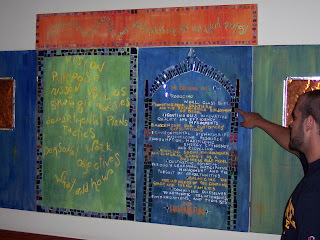 Whenever I schedule private tours, I am usually a little weary about how they will turn out. I don’t know why, but I am. Well, Diamond Bear ended up being one of my favorite brewery stops in my life. Our tour guide was Russ Melton, the president and owner of Diamond Bear. When we arrived, he gave each of us a pint glass to keep, and he filled them up with some of their tasty brews while he just chatted with us. Russ was one of the friendliest and entertaining people I have ever met. He treated us so well, and even did his Bill Clinton impression (the best I had ever heard, including Phil Hartman). He took the six of us all around the brewery, chatting away and really just acting like one of the crew. I am really glad that Ed was driving, because the beers kept coming, and I wasn’t refusing them. Eventually, we had to leave because we had another stop before heading home. I got some nice quotes for my article, but more importantly, we all got to hang out with Russ, have some awesome beers, and have a tour that we’d never forget. Normally, the Diamond Bear tour would have been the most memorable part of a Beer Trip, yet it ended up not even being the most memorably part of the day. Our next and final stop would be in Fayetteville, where we were meeting our good pals, Brett and Hannah, at Hog Haus for dinner and beers. We got to town, and it was a Saturday with a home University of Arkansas basketball game, so the town seemed to be jumping a little. We had to park in a lot pretty far away, and then we made the way towards the brewpub. Tim and I both have small bladders (although mine not as bad as his), so we were leading the pack. The other four were all behind us. As we walked around a building, some dude (known here on out as “Dude”) ran past us like he was being chased. Sure enough, he was, as two cops were running after him. We turned and laughed, and I jokingly said to Tim, “Don’t tase me bro!” Within two seconds, dude had two red dots on his back as one of the cops yells, “Freeze!” like in a 1970s cop show. Dude should have stopped. POW! He got tased, and dropped like a rock. Fittingly, he fell face first into a rock and was out cold. The ambulance came to take him away, but Jerry made sure to go around the area and take some good pics. After that, we met Brett and Hannah, and I remember having a good time and some tasty beers with them. I love Brett and Hannah, two of the best people I’ve met. I only wish I would have remembered more, but the combination of Vino’s and Diamond Bear before we met them made the rest of the night a little foggy. But I’m sure it was fun for all. We left Fayetteville, and I promptly fell asleep in the back of Ed’s van while Ed drove. That pretty much sums up why Ed is the most popular guy among the Beer Trip crew. Beer Trip Crew Presents "Their Dirt"
For those of you who know me, you know that my favorite book of all time is Motley Crue’s The Dirt. If you don’t know The Dirt, it is an account of the band’s rise to the top of the world of rock and roll, and the trials and tribulations they encountered along the way. It is written by the members of the band themselves, and the stories are told with the different guys in the band giving their recollection of the events. Andy thought that for this blog, it would be cool to do a The Dirt-style recap of the most famous Beer Trip incident, the time that Jerry smashed the RV into the hotel. So for those confused by Ed’s poem, read this and then go back and read his. The 27th of July started out pretty average. The night before had been a pain due to hotel issues, but I was looking forward to a fresh day. We were hitting some cool places, so I was ready to get going. Jerry had gotten destroyed the night before since that day would be his day to be sober and drive us around. Never the best day for that person, but it has to be done. Unfortunately for Jerry, he was going to have the worst designated driver day in BT history. The day of beer touring went as usual, and we were on schedule. Day Three of Beer Trip III was pretty typical. We woke up in Cleveland, had lunch and samples at Arbor Brewing, more samples at Kuhnhenn, even more samples, some peanuts, and a mini-tour at the Michigan Brewing Company, and then more beer at Founders in Grand Rapids. So far, so good (especially after spending the first two days as sick as I have ever felt in a long time, and not even because of beer), and the designated driver that day was the guy who knows and cares more about cars than anyone I know, Jerry. So as a second year veteran of navigating the RV, I was feeling cocky. All the fellas appreciated the grace-like skills I had with the beast, and at this point I felt like a rock star. That is...until the "mishap". 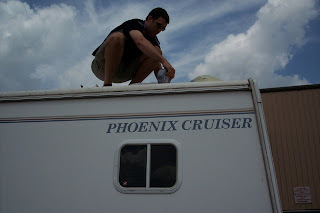 For me the memory starts with our fearless leader (let’s call him Dan) climbing up the ladder to the top of our rolling oasis – his parents’ RV. Seeing his ascension to the top, I grew concerned that something may be wrong with the RV. Once on the roof, he quickly started goofing around…. Surfing and the like. Soon Andy was rooting “Go Teen Wolf! !” This joyous occasion, turned quite different the next time Dan climbed those stairs. The EM-50 only a few short hours before the "incident"
We had a great day, we had been to four really great breweries, we were on a roll, and couldn’t wait to “hit” New Holland. Jerry, who prides himself on being a fantastic driver, as he should, chose to be the DD that day. We decided we’re going to check into the hotel before we head to New Holland Brewing Company. We made it through most of the day without any incidents. We were having a blast at Michigan Brewing Company that afternoon. They had a great tasting room and there was a crazy hippie couple playing music. We then drove over to Founders and had even more amazing beers. Met some funny/insane people, and from there we were going 30 minutes down the road to Holland, MI. Just so you know, when I am not driving during Beer Trip, I am in the front passenger seat because I get motion sickness. Doctors won’t prescribe Dramamine for Beer Trips, those jerks! So I am sitting in the front of the car, and our best driver is leading us in to the Country Inn in Holland. Dan had brought the Garmin this year and it was working like a charm....everyone was laughing, being silly, and ready to drop the luggage off and hit up the local bars with our new beer friends we had just met. When I pulled around to the front of the hotel, I noticed the "home feel" it had with a front porch and a few people sitting in rocking chairs enjoying the beautiful evening. I set my eyes on the front door of the hotel to properly line up the RV door with it for easy access for the fellas, and then it happened. The sound of the hotel awning ripping into our beloved RV sounded like the Hiroshima bomb had went off. Slow-motion ensued, and as I hit the brakes I look over at Dan, and we are both ducking and looking up. Before we could get stopped, I feel the RV suspension load up from the pressure of the hotel roof. The sky light explodes, I see daylight out the top, and finally, as icing on the cake, when I do completely stop, I finally hear the AC unit drop off the back of the rig. Keep in mind, we had just left Founders, and they had their Kentucky Breakfast Stout on tap, one of the best beers you will ever have. Also, it tips in at over 11% ABV. So Jerry pulls up to the overhang, I realize what is about to happen, yet I am speechless. I have no idea why, but everything is in slow motion as the top of the EM-50 smashes into the hotel and I don’t make a sound. I know I’m sitting in the middle of the bench behind Dan. We’re just bullshitting with each other when out of nowhere this very loud cracking/popping sound erupts, and then plastic pieces begin to rain down. The cracking and popping continues for all of milliseconds. I think we all realize at the exact same time what had just happened. Things get fuzzy for me at this point. It went from all of us talking and being happy as hell to a loud noise, stuff falling on us, and then silence. I was sitting in back on the passenger side on the bench facing the driver’s side. I remember the vent in the center had fallen to the floor, and I got up and thought picking it up and holding it to the ceiling would fix it or make what just happened not so bad. Jerry and Dan were up front and the only memory I have is both of them sitting in silence looking straight ahead. I was in the rear with the gear, and did not see the hotel, nor the low overhanging “A” frame entrance. It started with an unusual sound – that of bending and snapping metal. Then a small snap, and then the sound of air pressure being released simultaneously with a few more plastic snaps. To this point, there was only the sound of a collision, yet no feeling of impact or even stopping… it took several seconds for the catlike ninja reaction time of our driver to stop our traveling beer bus. Now remember, that most of us were not driving, therefore sobriety after four brewery stops was not possible. I looked up and found a new skylight where the rooftop air conditioning unit was. I was the first one out of the back of the now damaged EM-50, and what I noticed first was Dan’s face in the rearview mirror. He was staring straight ahead, his eyes were open but I’m sure he couldn’t tell you what he was seeing. It was the most deer-in-the-headlights look I have ever seen on another human being. All thoughts come back to our leader – you remember Dan right?? -- We just wrecked his father’s pride and joy. His face showed no emotion. This seemed like a poker game, and we just met the master of the table. I get out, and there’s a loud hissing noise, a weird smell, and some giggly girls hanging out of one window of the hotel pointing. I finally see what had happened. Behind us lay the A/C unit, hoses spraying air, liquid...I don’t remember exactly. I was numb. Those little awnings are amazingly strong. It scraped the top off pretty cleanly. I turn towards the front, and I see in the rearview mirror, Dan still sitting, staring straight ahead wide-eyed. I went over, opened the door, and got a “Just leave me alone.” I understood, shut the door, and walked back to help pick up the debris. Typically when you look at a road-side hotel, you see shades covering the windows of every room. This time, all I could see were faces peering out to see what just happened. Still peering out above the RV deck, I turned toward the back of the RV and saw that almost the entire vehicle had passed under the A-frame before stopping, and there was about ¼ inch of room between the top deck of the RV and the frame of the overhang. Everything on the top deck was missing. The antenna, the A/C, the skylights that bubble up about one-inch from the deck, the ladder…all were gone. It was as if a giant Tiger Woods swung a big stick and cleared everything off the RV. Cursing starts to ensue on the fact of "Did this REALLY just happen?!?!?" We all get out and assess the damage. It's not good! As stated, the skylight and AC are no longer. The upper luggage rack and ladder to the roof are in shambles, and I am pretty sure the RV roof leaks. There were some young teenage girls in their room a couple flights up that opened the window and laughed (loudly I might add) for the next ten minutes.....and I could have slowly killed each of them for that! The manager at the Country Inn was very cool and got us trash bags to help clean it up. Not much damage to the awning except some scrape marks. I honestly have no memory of what everyone was doing. I remember Jerry walking out to the middle of the huge parking lot by himself. Dan had to call and tell his parents we just crashed their RV into a hotel awning. We loaded the A/C unit into the storage compartment on the side, taped up the gaping hole in the roof, and locked it up. Calling my dad up was odd. I mean, they lent us their RV for the trip, and we (the Beer Trip crew, not just Jerry) had damaged it. I told my dad what happened, and all he said was, “Is everyone okay? Good. Well, patch it up as you need to, have fun the rest of the trip, and we’ll take care of it when you get back. That’s why we have insurance.” Once I heard that, there was relief. And honestly, I should have expected that to be his response, but I still needed to hear it. Especially after two days of being every kind of sick possible and not being able to keep anything in my body, I didn’t want a damaged RV to keep me from having more than a half a day of fun on Beer Trip. As Jerry and Dan drive off to park the RV, Ed and I proceed to die laughing because we had been holding it in for Dan’s sake. But holy crap was that some extremely funny stuff! After Dan talked with his dad to let him know what just happened, the teamwork and camaraderie of the Beer Trip fellas kicked in. Everyone pitched in to patch up the RV, put the broken pieces in the RV, and try to comfort my busted ego. I jumped into problem solver mode – trying to take care of the RV for the night – hoping that Dan would play his card, and let us in to his thoughts. We grabbed tape and plastic and covered all the holes in case it rained for the night, threw the A/C into the storage compartment. Dan climbed the stairs to look at the damage. At some point, Dan came out of his understandable stupor, and he was soon chasing Jerry around the parking lot trying to hug him to show no hard feelings. We actually had a great night of continued beer consumption. 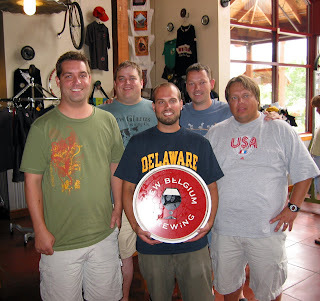 We went on to New Holland Brewing after all of that and drowned our sorrows. We had some fun with our now convertible roof the rest of the trip. And of course, it’s given us a story that everyone, except Jerry, gets a great laugh out of. We really needed some beers at the end of that day, and New Holland was just the place to get them! Beer Trip V is Shaping Up!